A New Shorty, A Question, and a CONTEST! UPDATE: The winner of the free download is Vi! This is a quick fly-by! I’ll be working at my dd’s shop for half the day, and then heading out to hit a flea market a couple of towns away. I love flea markets! So many hidden “treasures!” Be sure to check out the contest details at the bottom of this page! I promised a new short story every Friday until April. 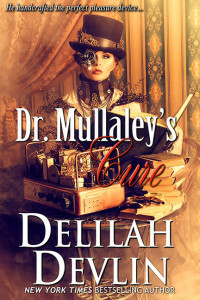 Here’s this week’s new release, Dr. Mullaley’s Cure. For now, these 5000-word stories can be found only on Kindle. They are free to Kindle Unlimited readers and just $.99 to everyone else! Be warned! It’s medical erotica (do you want to play doctor? )—not romance! Get it at the Kindle store! I’d been warned the doctor was a bit eccentric. That he dabbled in machinery and had been ostracized by others in his profession for the lengths he went to please his patients. “You’ll never find another employer,” I was told. “Not once they see your only reference is Doctor Mullaley.” The mad Irishman. The charlatan who promised cures to bored housewives and whose waiting room hadn’t been empty since I’d arrived for my first day’s work. If I hadn’t already been turned away at every other respectable physician’s practice, I might have heeded the advice. However, those warnings only served to stir my interest. I was intensely curious about the nature of the doctor’s cures. Even more so about the conditions he treated, but they were only spoken of in whispers and never in the presence of an unmarried woman. Which made me wonder why he’d hired me. Not that I was going to complain. One glance at his tall rangy frame, frosty blue eyes and dark, slicked-back hair, and my misgivings evaporated. However, my curiosity about the man and his practice wasn’t to be satisfied at that moment, because the doctor waved me toward the reception desk where I worked at fitting in patients who arrived without an appointment. A task I found akin to cinching in the waist of a corset. There was only so much ribbon one could pull before something gave.